Welcome to the platform of Indiacafe24.com. We are happy to have such a talented artist and entrepreneur with us. Ms. Reena we request you to introduce yourself to our readers. I am a working woman, wife and a mother. I am from Goa the land of sun, sea, sand and a unique history and culture. Currently am working for a Pharma Company. I write short stories and articles on whatever inspires me. I like photography and in my leisure time I like to learn a new art. “But my passion and something very dear to my heart is Knitting. I knit with set of five or eight double pointed needles. It’s enjoyable, fun and relieves the day’s stress; whenever I am sitting, I am knitting, “My day is never complete without knitting. 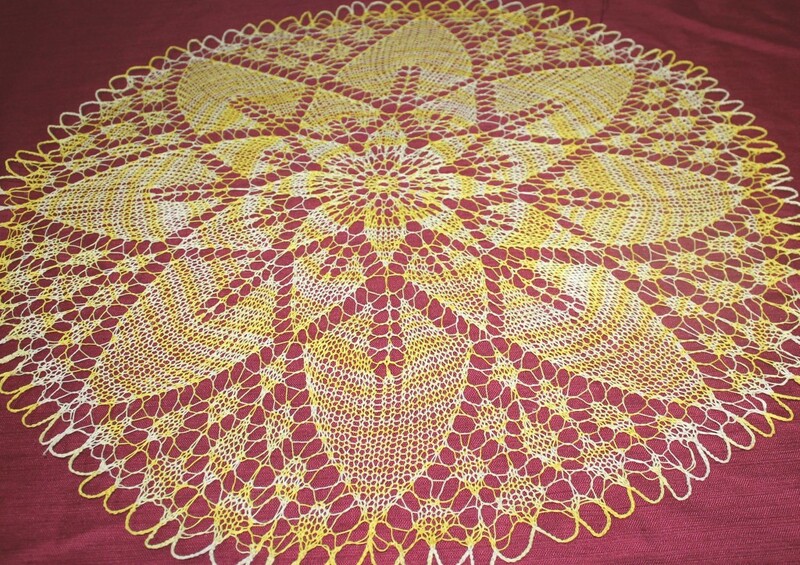 There’s always an excitement of completing a new pattern. I firmly believe in the phrase that “Whatever happens, happens for a reason”. Just believe in your dreams, believe in God and follow your heart. Patience, determination and being passionate towards your work are important. I always wanted to be an Artisan, a passionate learner and a professional in whatever I do. So always dream BIG. 2) What is the concept behind launching Knit N Purl Ocean? After dabbling into Arts, Crafts & Knitting for several years, I had taken part in lot of online contests where my work was appreciated. But there was no particular platform where I could showcase my work. Knit n Purl Ocean was launched to have a platform where I could showcase my Crafts and Knitting to the world. My Facebook page Knit n Purl Ocean (http://www.facebook.com/knitnpurlocean) deals with my knitting work and all the other crafts that I do. My page is viewed by many people and I get a lot of feedback and appreciation for my work. I am currently working on creating my website. 3) Who was the one who first realized that you are creative and can take this art forward? I have always been a very creative person with a craving to learn something new every time. 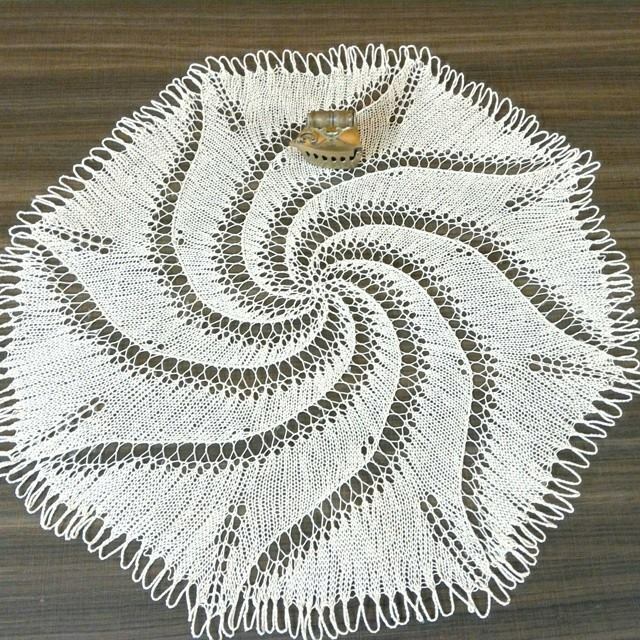 Whenever I used to see a new and unique handmade item there was always a curiosity to get into its details. The seeds of creativity and the “Never Give Up” attitude has been planted into me by my Mother, who is a very creative person. I have always admired her engagement into learning lots of crafts and creative things. Patience, Dedication and Passion is what I have learnt from her. My Mom has always been very supportive and taught me to Knit. She has always motivated and encouraged me in building my career and my hobbies. 4) What types of products are you crafting using your creative art form? 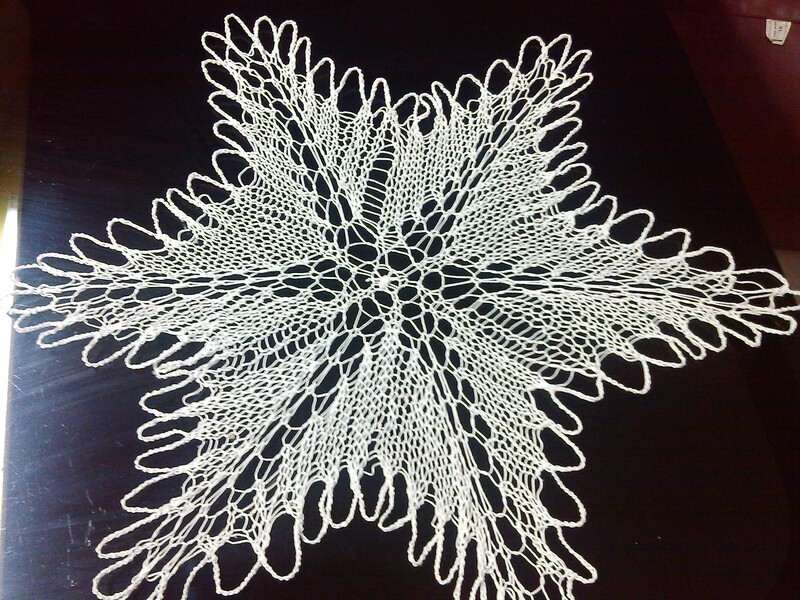 My product portfolio includes home décor knitted products which range from small doilies in round, square, and oval shapes, table centers, dining table sets, center pieces for glass and wooden furniture, bookmarks for the book lovers, customized knitted set for the living room furniture and baby products that are bought by customers as gifts for special occasions and to decorate home. 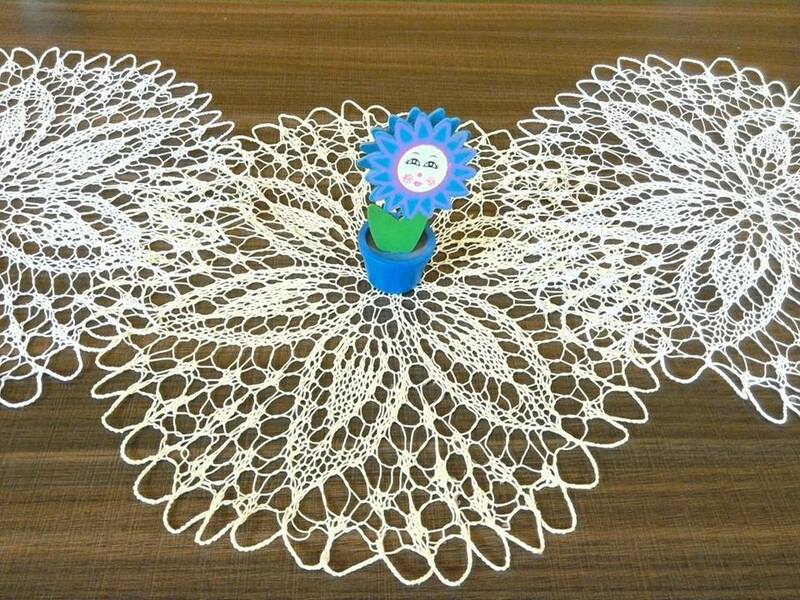 5) Do you design Doilies and other products based on any specific pattern or it’s just your creative imagination? Are you into customized designs? Knit n Purl Ocean creations are very unique and beautiful patterns. Each individual pattern has its own persona, creativity at its best, and an identity of its own. 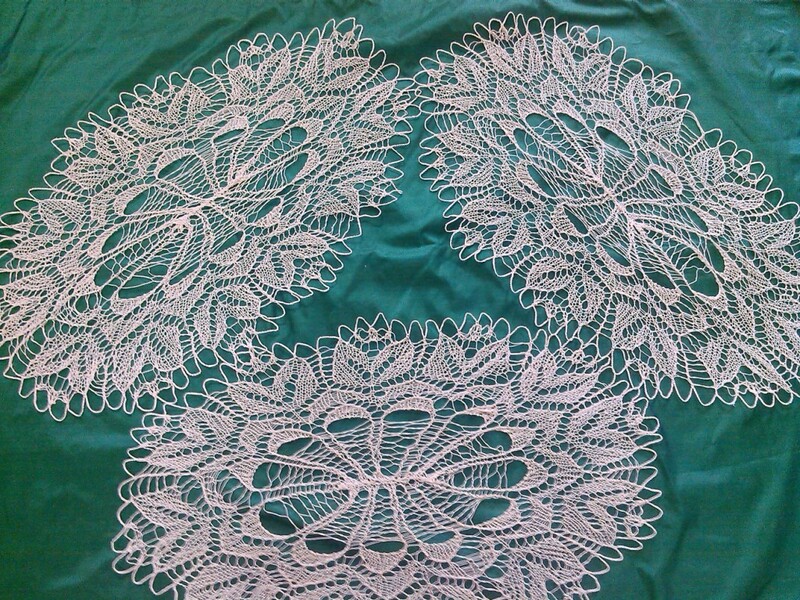 Most of the doilies are knitted as per the patterns available. Sometimes I design my own patterns to suit customized orders. I put in a lot of effort in creating every single piece which consumes a lot of time, patience and energy. 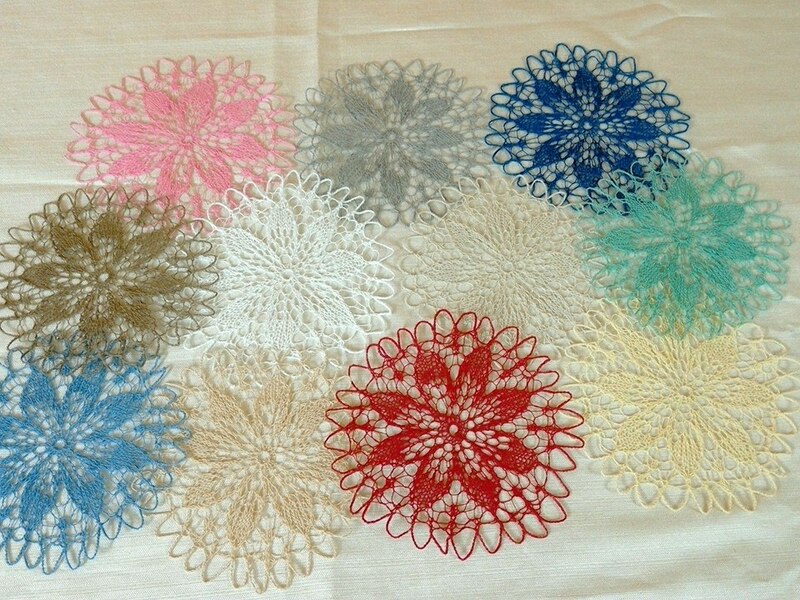 The Yarn is personally selected by me, the Doilies are mostly knit in White and Beige color, unless a customer specifies a particular colour to match the furniture. The final knit product is of much superior quality and it’s something one can treasure for its lifetime, something that brings a smile on everyone’s face, something that makes one wonder “How beautiful is this !!”. 6) What type of thread are you using in your Knitting and from where are you sourcing it? 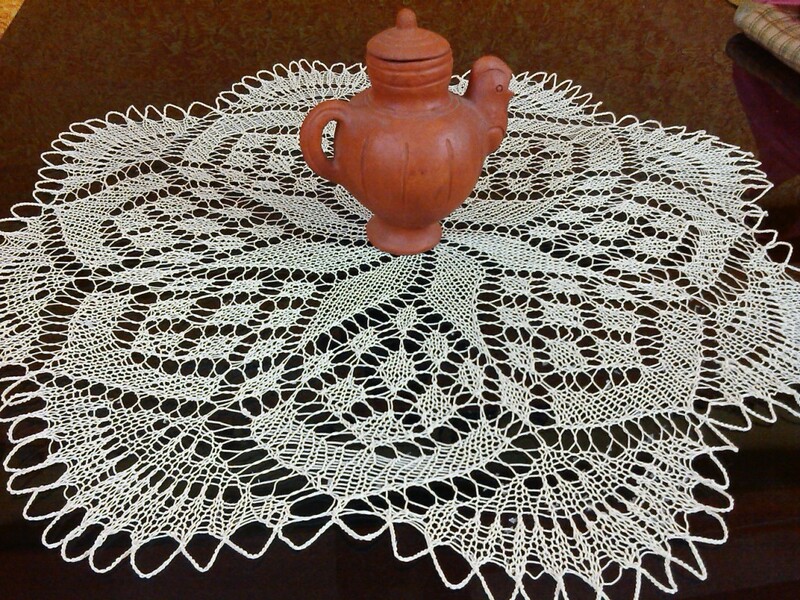 The doilies are knitted with Red Heart Yarns cotton thread and Anchor knitting Cotton. 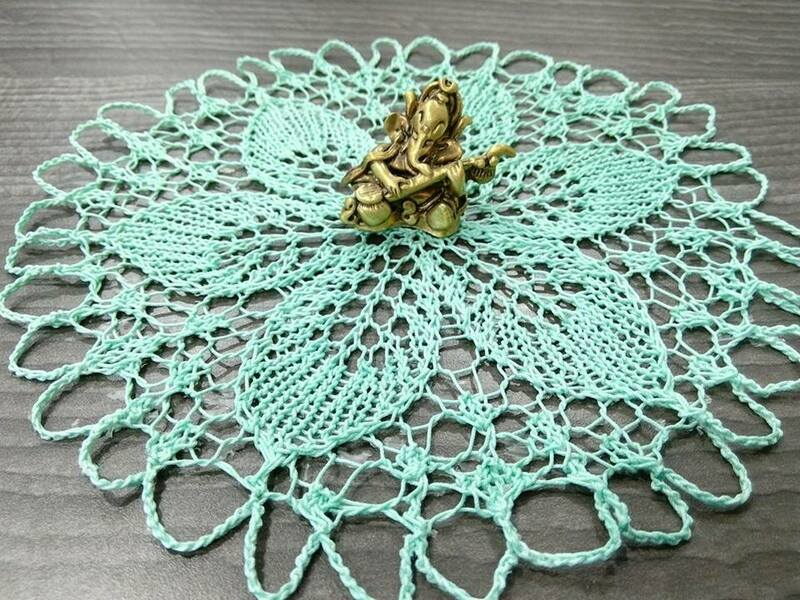 These threads are locally available and I also procure them from Mumbai. 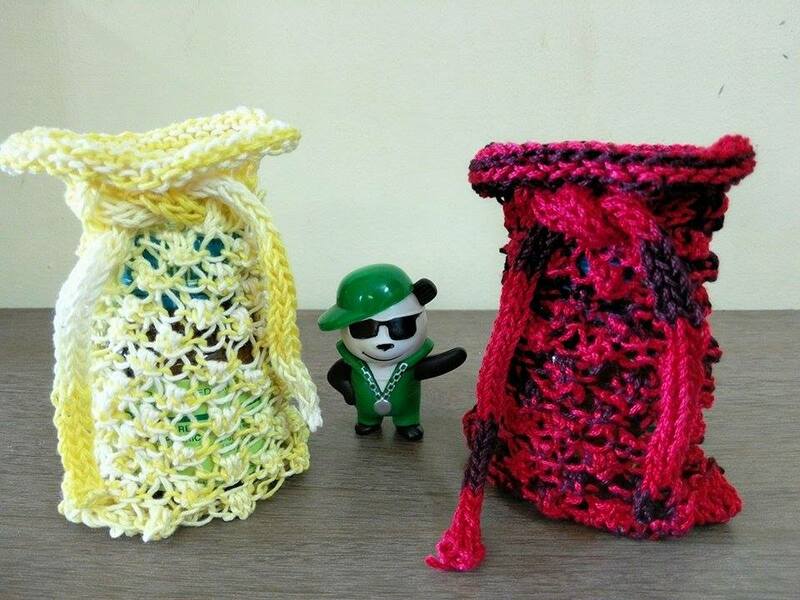 The baby products are knitted with Baby soft Yarn. 7) Have you been trained in Knitting? No, I haven’t received any training or attended any classes in Knitting. 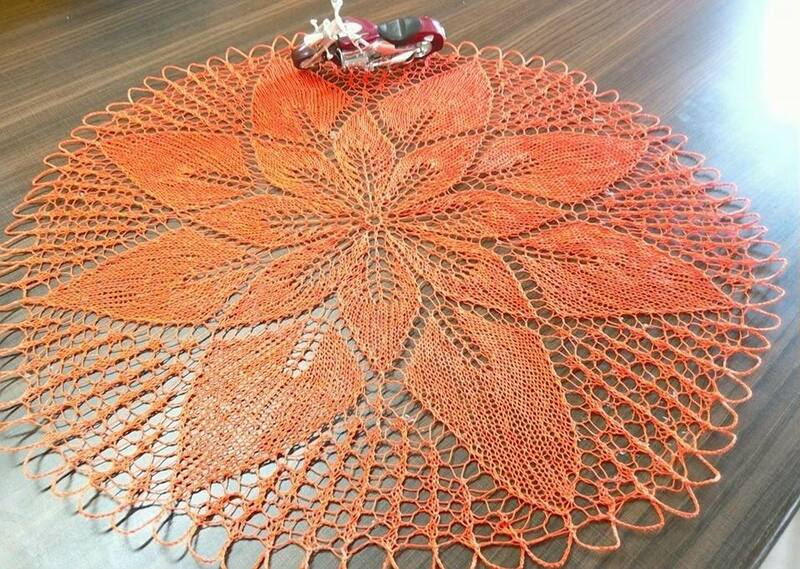 I learnt this art from my Mom at the age of 8. 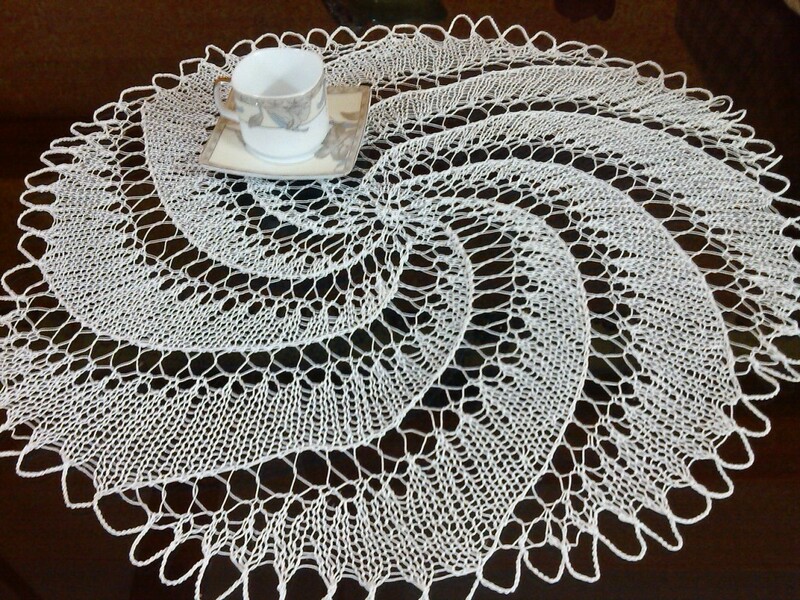 “It was a memorable moment when I knitted my first doily, handling all the five needles together and it was perfect. After this it has been a continuous journey, trying to self learn more difficult patterns, the different types of knitting stitches and experimenting with them to create new patterns. 8) Knit n Purl Ocean is a unique name. How did you choose on it? I have been asked this question many times by those who follow my work. Well, Knit and Purl are the two basic stitches in any knitting project and these stitches are the first knitting lessons from my Mother. And it’s an Ocean of all the other creative Arts and Crafts that I do. Hence the name Knit n Purl Ocean. 9) Who are your targeted customer? 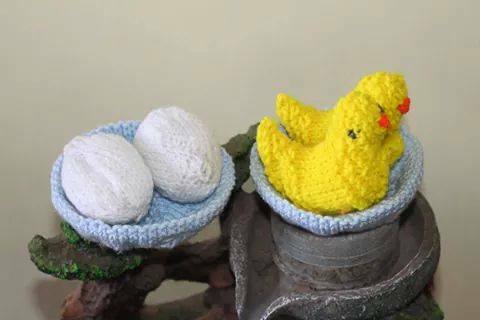 All those who are interested in handmade knitted gifts are my clients. 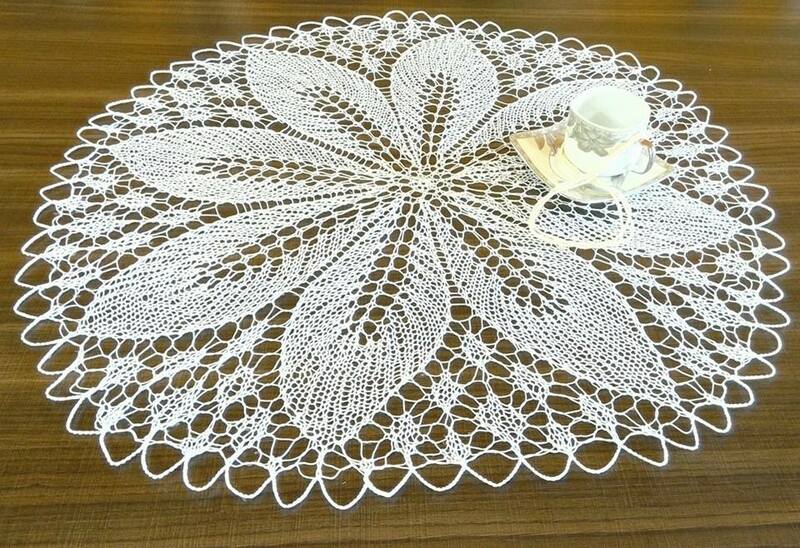 The knitted doilies are just the unusual presents, gifts for house warming, weddings, anniversaries, birthday gifts, for the living room or simply perfect for any occasion. 10) How do you reach your customers and what sort of response are you getting from them for your creativity? Many people already know about my art and they are my regular clients. I have a strong presence on social media (Facebook, Twitter and Instagram) and a lot of Knitting Groups and the feedback has been very positive. It’s the immense appreciation and strong support I get from people that keeps me motivated to try something new. 11) What are your future plans for Knit N Purl Ocean? I am at present working on my website which will be launched very soon. My products will also be available for the buyers on online portals. 12) What are your other passions in life? I write short stories and articles on whatever inspires me. I like photography and in my free time I like to learn a new art. I love to read books. A little diversion from Knitting I endorse myself in Glass painting and Metal Embossing. 13) How to contact you for placing orders? 14) Do you have any team with you for assisting you in your work? Knit N Purl Ocean is a one-woman show, right from knitting, designing patterns, marketing to logistics, everything is managed by myself. I also handle my social media. I love my work 🙂 . Right now I balance between my Job, my family, running behind my little prince and also continue with my passion of needle craft. I am proud to say that I have learnt to balance between the things I love to do – not just my work and the rest of life, but work and family and hobbies and chores and everything else. 15) What are your views about Indian women entrepreneur and how you want to encourage such ladies who want to come up and establish them as entrepreneurs? India needs a lot more Women Entrepreneurs. We all have hidden talents, one just needs to explore the talents hidden within. Always have a positive attitude, big dreams and a big vision. Do you work with passion and everything else just follows. I am a big admirer of all those women who excel in life, who keep dreaming and strive to make their dreams come true. 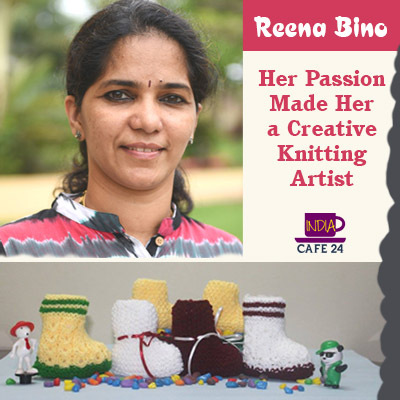 16) Define Reena Bino- the Knit N Purl Ocean designer? 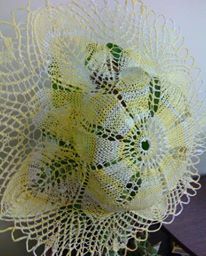 I am a knitter of my passion and my dreams just the way I knit Doilies. A strong believer in God, I believe in myself, my work and my dreams.